David Farragut began his life as a sailor early; he commanded a prize ship captured in the War of 1812 when he was just twelve years old. He was born July 5, 1801, and was commissioned Midshipman in the US Navy December 17, 1810, at age 9. By the time of the Civil War, Farragut had proven his ability repeatedly. Despite the fact that he was born and raised in the South, Farragut chose to side with the Union. Farragut’s greatest fame came from the August 5, 1864, Battle of Mobile Bay. The Confederates had placed a large number of “torpedoes” in the waters. The monitor USS Tecumseh struck a torpedo and began to sink, causing the rest of the fleet to back away from the mine-infested waters. At the time, Farragut was watching the battle while lashed to the rigging of his flagship (USS Hartford). Alarmed, Farragut shouted, “What’s the trouble?” The USS Brooklyn answered, “Torpedoes!” Farragut shouted back, “Damn the torpedoes! Four Bells! Captain Drayton, go ahead! Jouett, full speed!” In the end, Farragut’s fleet defeated Confederate Admiral Franklin Buchanan and the last open seaport on the Gulf of Mexico fell to the Union. Bruce Tucker holds a BA degree in Political Science & History from Herbert H. Lehman College of the City University of New York and a MS degree in Information Technology & Project Management from the Stevens Institute of Technology in Hoboken New Jersey. Bruce spent 25 years working in advancing positions of Systems Support/Project Management, Process Design/Management, and Learning Development/Content Management. As a second career, Bruce now teaches history at Rutgers University in New Brunswick for the Osher Life Long Learning Program (OLLI-RU). 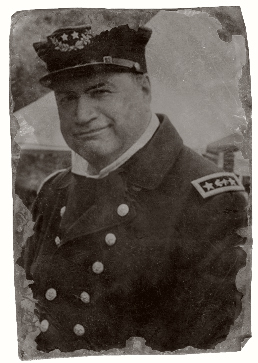 Since 2009, Bruce has presented living history as both Rear Admiral David Glasgow Farragut and Captain Uriah Phillips Levy, USN, to churches, synagogues, schools, libraries, museums, senior centers, and Civil War roundtable groups in NY, NJ, CT, DE, and PA. He is currently the President of the USS LEHIGH/USS Monitor Naval Living History group and Corresponding Secretary of the Navy Marine Living History Association.